Everything you and your team need to recruit successfully. Intuitive user interface makes it simple to set up new users, jobs, adverts, recruitment process and templates. Once you’ve set up one job, it’s super quick to set up future jobs. Clone or customise existing jobs, job adverts, process, forms and email templates. Affordable monthly plans. Upgrade and downgrade as required. Pay as you go. Unlimited Users. Whatever your recruitment experience, all the support and tools are provided to help develop the key skills to hire right. Recruiters, HR Advisors and Hiring Managers can easily collaborate and share information, assign tasks and track status. Make decisions together to make the right hire. Step by step recruitment guides are provided to help you achieve hot results. Inbuilt recruitment activity reporting captures hiring and recruitment metrics to help continuously improve your recruitment performance. Managing recruitment has never been so easy. Helps you to quickly capture, track, review and manage job applications in one central online system anywhere anytime. Follow the simple 8 step process to set up a professional recruitment campaign. You can quickly clone for future jobs. System keeps your team on track and organised managing and tracking applicants through your recruitment process. Quick and easy for your team to review, share and discuss applicants CVs and candidate evaluation forms. Our job application management software helps you to quickly capture, manage, review and track job applications in one central online ATS tracking system anywhere, anytime. All the online recruitment tools you need to set up and manage a recruitment campaign. Job adverts, job syndication, application forms, recruitment process, evaluation forms, emails, reporting and more. Covers Approval to Hire to Onboarding New Employee. Quickly process offer packs. Reduce time and cost of resources, material and delivery. Efficiently track and manage acceptance and receipt of employment documents. Easy to build and search your organisation’s applicant and candidate database, add prospects, build talent pools and manage talent email marketing campaigns. Help Centre is packed with tips and resources to help you easily use the software. If you can’t find what you are looking for, submit a support request ticket. Support is via email, phone and online web meetings. Office hours are Monday to Friday 8:30am to 5:00pm (excl public holidays). Learn from our comprehensive recruitment resources. Develop the capability to hire right first time. Our recruitment management software has helped small to medium sized businesses make 100’s of new hires. I have been using Chillifactor recruitment software for over two years now, and absolutely love it! In my previous role I introduced the software to a large multi-national I was working for, where the authorisation process was complex and a continual source of friction. Kirsten and her team quickly adapted the system to the needs of that business, and to this day authorisations are well managed, and delays in getting offers to candidates have been dramatically reduced. Since establishing my own business, where recruitment is central to our offering, I use the software to ensure that clients are giving me the green light to proceed with each step of the process, and that my client accounts are well managed. This keeps them informed and safeguards me – especially when queries are later raised… I cannot speak highly enough of this innovative, cost-effective and service orientated solution. I have been working with Chilli Factor now for over 8 months and find it to be an extremely user friendly recruitment tool. The programme ensures candidates go through a preferred process making it easy to follow up and manage candidate care, to manage all of the recruitment stages and keep all candidates details in a central location to refer back to. The icons are easy to understand as I have been up-skilling branch manager’s on its use, it’s reporting functions make life easier at month end, and the centralised management of external promotional channels makes it a great one-stop shop. 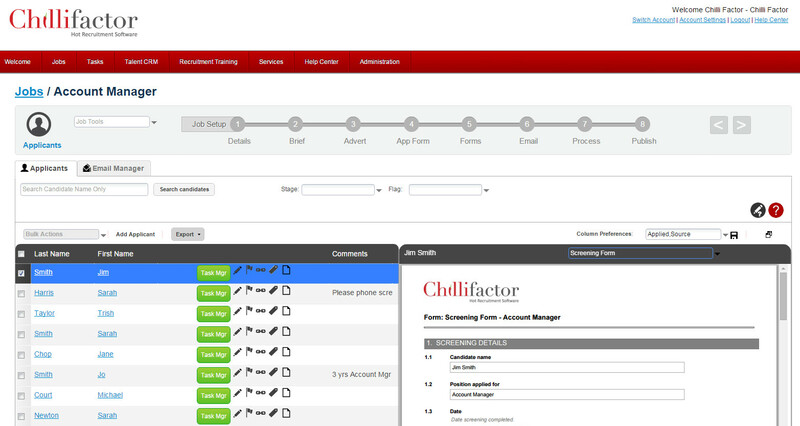 I would personally recommend Chilli Factor to any company wishing to centralise and improve their recruitment processes.